Welcome to Gaspark Solutions Ltd.
Gaspark Solutions Ltd is an NIC EIC Approved contractor, NIC EIC Domestic installer, Part P registered, AICO smoke & CO alarms expert installer, Gas safe registered, CHAS Health & safety accredited, fully qualified & fully insured company based in Newport & Cardiff. We cover all aspects of Electrical, gas & plumbing works through the domestic, industrial & commercial industries. Our expert installers are at the top of their game when it comes to workmanship and we are annually inspected by the electrical & gas industry governing bodies to ensure we continue to reach the highest standards that we expect to be carried out daily. A huge drive for Gaspark Solutions Ltd is to ensure customer service is second to none. We want to be recognised to be the very best at not only carrying out our works to the highest standard, but to automatically set the customer at ease from the very first point of contact to the satisfactory completion of works. 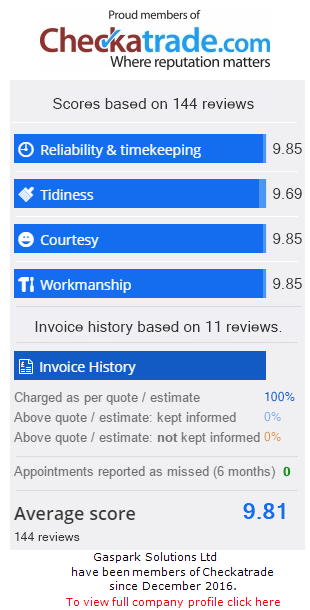 We appreciate working in our customers homes can be a daunting prospect for them and because of this we continue to update the customer through every step of the work. Cleanliness is also one of the most important aspects of our works and we ensure dust sheets, over shoe protection and good old Henry hoover is used on every job without fail. We thank you for taking the time to visit our website and we look forward to proving to you that you made the right choice in selecting the best electrical, gas & plumbing contractor around. Get in touch for in instant no obligation quote. All goods / materials supplied remain the sole property of Gaspark Solutions Ltd until paid in full. Any accounts outstanding beyond these terms will be subject to interest under the late payment of commercial debts regulations 2002, at an annual rate of 8% above the bank of England base rate, until the invoice has been discharged in full. Under the late payment of commercial debts regulations 2002, the customer will be liable for a compensation charge payable to Gaspark Solutions Ltd. In the event of non-payment of the invoice, all debt recovery costs will be charged to the customer. Any complaints must be notified by the customer to Gaspark Solutions Ltd in writing within 7 days of the date of invoice. Full Rewire, New Heating System + Bathroom/Kitchen Plumbing. "Excellent from start to finish, the quotes were easy to understand, all works were carried out to an excellent standard and on time. Would highly recommend and will certainly look to use these guys in the future." I cannot recommend Gareth and his company highly enough- diligent, knowledgeable, tidy, took pride in the work and provided regular updates on progress. Installed an outside double socket. Excellent job done; really pleased with the work. Very reliable in terms of time keeping and superb cleanliness whilst working! Wouldn’t hesitate to recommend! New radiators, new washing machine all in completely different places. Excellent, Joe went over and above and had lots of patience with us!! Highly recommend. Gareth and his team were exceptional from start to finish. I would highly recommend Gaspark Solutions and will no doubt be using their services again. Regional Manager at The Medical. Copyright © Gaspark 2018. All rights reserved.